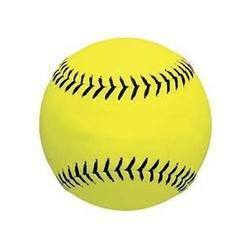 Being a foremost organization in this industry, we are actively engaged in offering the finest quality range of Sport Softball Ball. Base ball balls being manufacturers according to international standard and can be also produced and supplied with buyer's logo and brand name. Synthetic covered ball with cork center Red stitch. Backed by our expertise, we offer a superior range of Bhaseen Crown SoftBall to our clients. These balls are designed using premium quality raw materials and advanced technology under the guidance of qualified experts. They can be offered as per the diverse specifications of clients. These can also be gained from us at cost effective prices. Backed by huge industry experience and market understanding, we are involved in manufacturing a wide variety of Practice Softball for our valued patrons. Vinyl covered Polyster filled balls for multi activites. We are a highly acknowledged organization, engaged in presenting a remarkable range of Printed Soft Ball.